Welcome to the official Blog of "Insulin Potentiation Targeted Therapy" a medical procedure in Alternative Medicine, developed and researched for over 80 years by 3 generations of medical doctors, named Donato Pérez García. Read our blog and find a cure. Breast malignancies are histologically verified by fine needle biopsy. Insulin/chemotherapy cycles are repeated twice a week for 3 weeks, and then weekly for another 3ó6 weeks depending on clinical findings. Fasting subjects receive insulin (0.3 U/kg) and, at onset of hypoglycaemia, cyclophosphamide 8 mg/rn2, methotrexate 3 mg/rn2, and 5-fluorouracil 50 mg/rn2 with 50% hypertonic glucose, intravenously. On non-treatment days, patients are given oral cyclophosphamide 50 mg and rnethotrexate 2.5 mg.
Insulin Potentiation Therapy (IPT) was invented in 1930 by a surgeon lieutenant of the Mexican military, Dr. Donato Pérez García, Sr. (1896-1971), as a remedy for chronic degenerative diseases. Insulin was first isolated from pancreatic tissue in Canada and used as a treatment for diabetes in early 1920’s, years later in Europe and in the USA, insulin was used to produce coma for short periods in patients with schizophrenia in an attempt to cure them. Among other uses, was to treat some forms of malnutrition. In 1926, a non diabetic first injected himself with insulin, proving it was safe and efficient. After a series of treatments, his symptoms disappeared; he recovered appetite and full health again. The idea was that insulin helped his body tissues assimilate nutrients more efficiently and pondered that could just as well work with medication. Insulin could increase drug concentration potency in the central nervous system, given before various medications, changing the physical and chemical reactions that occurred in the blood, restoring balance and maintaining a state of good health. And it did. In 1930, Dr. Donato successfully treated a patient with neurosyphilis using the name of Cellular Therapy, later known as IPT. 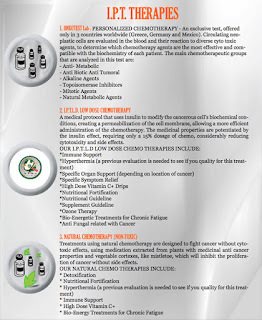 We feed the cancerous cell with chemo. Cancer cells take in the chemotherapy drugs much more easily with insulin; it potentiates medication, transporting it more effectively into the cells. Insulin Potentiation Therapy Low Dose® changes the bio-physic-chemical constants and parameters of the blood, attacking first the cancerous cell through its intra-extra cellular environment, causing permeability in the cell’s membrane. In other words, insulin makes the cancer cells hungry for food (sugar) and in this state gobbles up everything you put into it, even chemo drugs, causing its death. One by one, cancer cells diminish in the affected tissue. Until they all die. Healthy cells remain intact. Allowing white cells to clean the entire system. 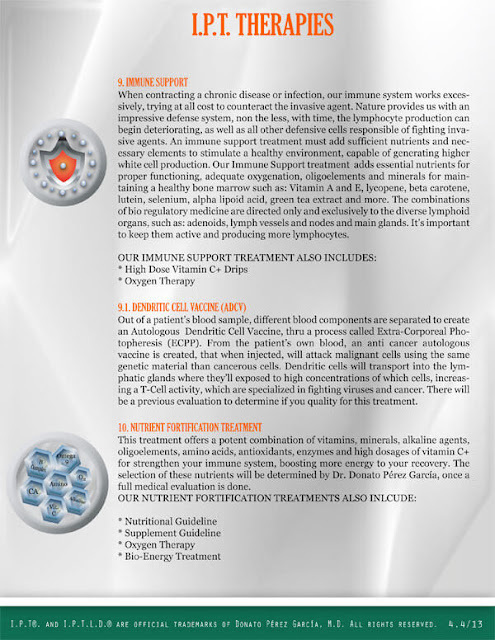 Promoting and strengthening your immune system, protecting you from any carcinogenic agent. Because people respond differently to similar chemo drugs and other prescription drugs including insulin, very few have allergic reactions such as fast heartbeat, low blood pressure, itching, or rash; reactions that do not endanger life and can be safely reversed with the appropriate medication. Those Therapies, works well with IPT treatment as a complement.
. WHO CAN RECEIVE I.P.T? Men and women, young or elderly adults with a chronic illness or other medical conditions.
. CAN I USE IPT® FOR SOMETHING ELSE THAN ISN’T CANCER?
. IF I START IPT®, HOW WILL I KNOW THAT IT’S WORKING? Before you begin treatment, the doctor will require a full medical evaluation that’ll include laboratory and imaging tests, such as urine, blood works, PSA levels, X-Rays, CT Scans or MRI’s (depending on your case) and use them as a comparison to measure your progress thru out the rest of your treatment. Results have to be measureable, quantified and physically proven to you before considering any other phase of treatment.
. CAN IPT® CURE ANYTHING? No. We are very honest with patients when they come in for first time consultation. If the illness has no cure or is too advanced, the doctor will be open and tell you honestly if it’s curable or treatable, or if IPT® can provide long asymptomatic periods or a better quality of life for the patient.
. CAN I PAY THIS TREATMENT WITH MY MEDICAL INSURANCE? In some cases, yes. Depending on your insurance company policies, whether it covers international services. Know that both Dr. Donato and Hospital Angeles can arrange all necessary documentation your insurance may require. We’ve helped other patients get reimbursed for medical insurance and it’s an open option you can consider.
. I HAVE MORE QUESTIONS, WHOM CAN I TALK TO? You can either call, skype or write to us with your questions, an IPT® Representative will assist your inquiring needs. Look up our contact information and schedules right here in this website. a treatment for immune system, can be very effective to help in the treatment of any degenerative disease.